other places on the equator. has some of the best scenery in Africa composed of swamps, lakes , rivers mountains and semi-arid lands. The biggest lake, Lake Victoria, is found in Uganda, the longest river, River Nile, starts from Uganda, and Uganda also has some of the most magnificent mountains too, where visitors can still find mountain gorillas in protected parts of the country. It is also a 'heaven' for those interested in birds! Little as it is, Uganda has 10 national parks, 7 game reserves and around 30 national forest reserves where birding vacations are the order of the day. The people of Uganda are very proud of their culture, for there is more than 50 ethnic tribes with different traditions, languages, dancing and music. inhabitants, and is the centre of a hilly district of the same name. district headquarters.The area is also referred to as Kigezi, a former district covering the entire southwestern corner of Uganda. Aa mentioned before, Kabale is not part of your typical hot Africa! For many Ugandans, Kabale has the reputation of a being a very cold place even in winter (June-July), but the temperatures have been slowly going up, and for most 'Westerners' Kabale will be a warm and comfortable place. .
Kabale has many little local shops, some with tailors sitting outside creating clothes on their sewing machines, and carpenters making their crafts. There are three or four supermarkets, some banks and restaurants, internet cafes & hotels of varying quality & price, and proud school children walking to and from school in their colourful uniforms. There are buses travelling from Kampala, the capital, through Kabale and on to towns and cities in Rwanda, and there are lots of 'bicycle taxis' or 'boda boda' taking people about their daily business. There are markets to explore with local crafts, and wonderful stalls with a variety of fruits and vegetables - as well as the 'enterprising business person' selling the odd 'hand of bananas' or fruits and nuts around the streets . In fact all of life is here!! Kabale is also a good base to see the beautiful and scenic surrounding countryside, and to track the world’s remaining few hundred mountain gorillas in Bwindi and Mgahinga National Parks, since part of Bwindi NP is within Kabale District, 30 km away from Kabale Town. Mgahinga is 70 kmaway. For the adventurous, you can get more information from Gorilla Parks Information Office in Kabale, but you will probably need to book your gorilla permits from Kampala. For others there is still plenty to see and do in the area around, including the beautiful area of LakeBunyonyi, and also of interest is a visit to see the local blacksmiths up in the hills making their tools. Lake Bunyonyi "Place of many little birds" lies between Kisoro and Kabale close to the border with Rwanda. Located at 1,962 m above sea level, it is about 25 km long and 7 km wide. The depth of the lake is rumoured to vary between 44 m and 900 m, which if true would make the lake the second deepest in Africa. It is one of the few lakes in the region that is free of bilharzia and safe for swimming. The lake appears on the 5,000 Ugandan shilling note under the title "lake bunyonyi and terraces". Towns on it shores include Kyevu and Muko, while its 29 islands include Punishment Island and Bushara Island. It is a popular location for watersports and is known for the surrounding terraced hillsides. It is popular with both foreign and domestic tourists and there are a wide variety of tourist accommodations. The temperature on the surface of the lake can rise to 25 degrees Celsius. In the beginning of the 20th century, fish were introduced to the lake and in the 1930s fishing became profitable. Unfortunately in the 1960s the fish died massively as a result of a violent shallow mixing, likely caused by wind. Subsistence fishing prevailed in the lake, people mostly caught clarias species - the lake's depth and stratification makes it difficult for the breeding of the common Ugandan species Nile Perch and Tilapia. Nevertheless, 300,000 Nile Tilapias and Clarias fish were released in the lake at the end of 2002. Also present in the lake are Mud fish, Cray fish and Mirrowcarp - and plenty of their predators, otters. The lake's main centre is Bufuka Village. 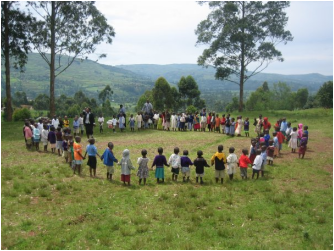 The area's inhabitants are from the Bakiga and the Batwa tribes.